Other airlines are likely to follow Southwest’s example, putting pressure on Boeing to finish fixing software on an anti-stall system implicated in two deadly crashes. Last month, Boeing and federal officials said privately that the company would finish its work before the end of March. Instead, it was delayed by an unexpected problem that Boeing hasn’t fully described, and the company is now aiming to complete its work by late April. Boeing CEO Dennis Muilenburg said the company’s pilots have flown 96 test flights totaling 160 hours with the new software and will operate more in the coming weeks to prove that the fix works. “The general flying public seems to be asking more questions about the airplane than they have with prior fleet groundings,” said Goldman Sachs analyst Noah Poponak, referring to the 2013 grounding of Boeing 787s because of overheating lithium-ion battery packs. The 787 survived and became a hit with airlines and passengers. “This will not be a minimum-training event to just get by,” he said. The longer the Max planes sit on the ground, the more money airlines lose. Southwest already figures that just the first three weeks the Max had been grounded, along with other setbacks, cut the airline’s first-quarter revenue by $150 million. That is 4% of Southwest’s 4,000 daily flights during summer. 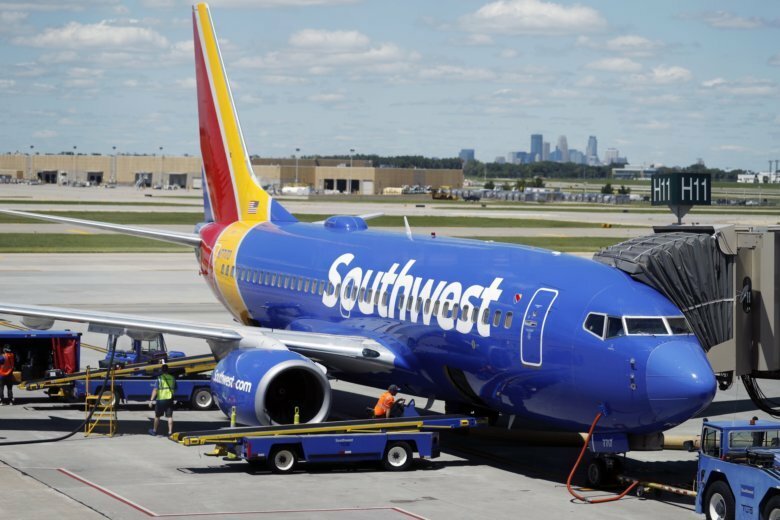 Still, unless the airline finds replacement planes quickly — and that can be a complicated process — Southwest will scrap about 10,000 flights that could have carried nearly 1.8 million people between now and early August. American Airlines doesn’t expect its 24 Max jets to be flying before June 5, and it too is canceling about 90 flights a day. Harteveldt said he expects airlines that don’t have Max jets — a list that includes Delta, JetBlue, Alaska and Spirit — will court travelers with price-cutting. With aircraft orders booming, Boeing shares have soared for more than two years, although they dropped about 14% from March 1 through Friday’s close. Most of Wall Street has expressed confidence that Boeing can fix the Max quickly and regain momentum. Since its launch in 2017, the Max had emerged as Boeing’s best-selling jet. Fewer than 400 have been delivered, but about 4,600 are on order. Boeing hasn’t provided numbers on the financial impact from the Max crisis.